To achieve success, you need to get your team on the same page that you are on. Keep yourself in check, make sure you do what is in the best interest of team success. Don’t try to be a basketball genius, keep your plan simple, focus on execution. Normally, on a backscreen, Carleton players will jump under the screen trying to force the cutter to NOT run where they want to run and thereby force the ball back to where it was originally. However, if a team is down by a significant amount of points, they should get up tight on the cutter (who is looking to come off the screen) and push that offensive player hard. Need to think that, if down by a large margin (15 for example), you can take advantage of being the underdog, getting some breaks from the ref, and not having some fouls called against you. If a team is up by a decent margin, the ref will likely focus more on them (subconsciously trying to even out the game and enable an opportunity for the losing team to come back). Teams need to compete and fight right to the end (take advantage of a team that is ahead and starting to feel comfortable with their lead) – concept of being competitors and NOT feeling sorry for themselves. In a strange way, there are advantages to being down 15 (keep playing hard, fighting to climb the hill, coach is pressing the panic button in a timeout, players are doing whatever it takes) as opposed to being up 15 (taking foot off the gas pedal, slowing down, not cutting as hard, not making strong screens, not looking inside as much, awareness of running up the score – age dependent). You will never “know it all” so continue learning, regardless of your level. Don’t just do it because somebody else does it. Fit additional learning (from clinics, books, etc.) into your own style and philosophy. Be comfortable with your own philosophy, know what you are doing and why you’re doing it. Stay within your personality, coach the way that you are as a person. If you are a “yeller” and then you are quiet (therefore different), then something must be wrong. Players/people are smart and will perceive a problem based on behaviour. Be true to who you are because “falseness” is obvious to those who know you well enough. Develop trust individually, know that you can’t treat every player the same way. Need to respect the individual for who they are as a person and a player. Give players court time because they are GOOD, not because they are LIKED. When a game starts, coaches are trying to win, so they’ll put players on the floor that will give their team a better chance and therefore help them to achieve their goal of winning. Embrace leadership, if you’re going to coach then you need to lead. In order to lead your team, you first need to earn and gain their trust. Your leadership (by example) needs to foster their leadership (on and off court). Against a zone, you can’t afford to waste time, especially with the FIBA 24 second clock rule in place. Carleton runs the same offence against a zone or man defence. They will make adjustments based on the type of zone, but still run their man offence against it. All strategy begins with recognition of what is happening in the middle (challenge inside). If not sure of a zone read then assume defence is playing 2-3 because most teams do. Another key (in transition) is that the first big and trail post must get down court quickly (to exploit). On “break” play, Carleton runs high screens and handoffs versus a zone defence (just as against a man). Teams usually play zone defence because they don’t cover well in man (hiding a weakness). Objective in transition is to get the ball to the middle of the floor right away in order to exploit ASAP. If you can get to the inside then stop at that and play off of it (don’t run the rest of your movement). Philosophy of Carleton’s man offence is to get the ball to eight feet from the rim, cause defensive reactions and closeouts, get to smart open space, make good decisions, exploit the advantages gained. If Carleton can’t get the middle advantage, then next offensive goal is to attack the second weakest perimeter defender with Carleton’s best perimeter offensive player (which assumes that the opposition’s best middle defender is defending at the rim). With interior offence, make sure you make a good decision by putting your smartest player in the gap (regardless of size of player, they need to be effective, be a great decision-maker, be confident, be able to read well and play off their read). Simply putting a “big” in the middle is foolish because the position may prove to be too much for a player who is physically big but mentally weak. For that reason, a guard or smart wing player is a solid choice to place in the gap (whether you have a big that can play or a player that is resting on the bench). With early offence, ball and player rotation, objectives are 1) reverse the ball to forward on the side of the weak defender, 2) bring other forward from opposite side of the floor to screen for the weakside forward and then roll to the high post or elbow, 3) slide centre down to Russian spot, 4) keep guard up top (but faded) and an opposite (drifted) corner shooter. Best options coming down the floor are A) get the ball to the middle gap best player, B) reverse the ball to the weakside wing player to attack a weak defender, C) hit the big in the Russian spot and play off of that based on the defensive rotation. FAKE your intentions – even if you’re NOT a strong post player, (in transition) you should still hustle to the rim, sit and seal, and be a threat (you’ll cause two defenders to play you, will make it easier for your team to get open looks, and will help create opportunity). Always move players AND the ball against a zone defence (want to create mismatches in recovery). When reversing against a zone, try to get the ball (first) to the middle/rim, (second) to the elbow, (third) to the wing pop-out (as the post comes through from the weakside). Always try to get in to gap, tactic is to hide in behind first then come from behind the zone, flash into an open spot (not a predetermined spot) that is smart/good space, then play right away on catch of the ball. In order to gain an advantage, need to make the heads of a zone defence turn and look behind them (this is not possible unless you hide and are out of sight for a long enough time count). Option to the post always needs to be top of mind, MUST look inside, inside, and inside again. Post needs to always be thinking seal inside in low post (need for strong footwork), get foot in front, look for open Russian spot in order to try and get best defender away from his/her rim. If play not available in middle gap, then post up, then Russian spot, then reversal (or two), then be sure to move best perimeter player in position to play and exploit defender’s second worst player. Players on the perimeter must be moving or exchanging to get a good match-up on ball reversal. Within all attempts, attacking and spacing applies, must have a seal in the middle, a fade from top, a 45 degree wing, a flattened out corner shooter (concept of “space, fill, and drift” also applies to zones). If defence plays zone, concepts are to get good/big defenders away from their rim, put your size and length in positions of advantage, get a key match-up in your favour, make second weakest defender play against your best offensive threat. Want defenders making choices between two offensive threats, therefore need to move on zone offence based on WHERE the defence positions THEIR players, not where offence WANTS to put theirs. Must make the defence decide, which means two offensive players need to be of equal distance from the same defender (otherwise, on part of defender, no decision will be necessary). DON’T be in positions that allow one defender to cover two offensive players, especially NOT a weak or average defender covering two strong offensive players. DO put an average offensive player in a position that forces two good defenders to pay attention to him. Always look for action through the gap because it helps to open up the wing penetrators and shooters. Key is to put ball in hands of players that “can play” versus defenders that can’t contain them. Need to be looking to gain good 1-on-1 matchups (either inside or out). DON’T PRETEND to do something so that you can then do what you want (make a definitive move). DON’T be a non-shooter who never up-fakes (need to test the defender and keep them guessing). DO think and go to smart spaces, DON’T simply run through the offence like a robot. DO pick on weak opponents/matchups/defenders, even those on your own team in practices/workouts. Your own players need to be ruthless and cut-throat in practices (goal is to elevate the overall play). In practice, don’t feel bad for team-mates, exploit their weaknesses, force weaker player to make a decision to get better (or choose another activity), forces overall team to improve, keeps everyone hungry and going for another player’s position, keeps people sharp (and complacency out). The “cutter” in your offence should be your weakest long shooter, they can help you by attacking inside (cutting in from the ballside wing, the top, or the weakside 45 angle). As a player, you always need to be a threat – ask “how am I helping the team” – if you are short, and don’t shoot well, then you better learn to cut hard while you work on shooting and/or growing. Strategy with a weak shooter (who is a hard cutter) is if the ball is in Russian spot and another player is in the weakside low post, then make sure three players are well-spaced out on perimeter – if all three players are great shooters then defence is in trouble and must respect all three, otherwise send the weakest shooter through the gap using a hard cut and look to dish to them inside, they attack the rim. Need to put players in positions to succeed and exploit match-ups (either because of advantage at position, mismatch, numbers advantage, etc.) – simply looking to make good decisions, gain an advantage somewhere on the floor, and make each trip count on offence. When coaching, don’t necessarily run a zone offence and look for “equal opportunity” as that does not win games – need to have best players doing what they do best, in positions to excel, catching the ball in spaces from which they can actually play (DON’T catch where you can’t attack and play). Post players must move and seal – these are keys for them on every trip down court. If ball is at the wing, the post player must gain the Russian spot. If ball is at the 45, post player must be sealing and drawing two defenders (front and back, or two front). MUST work inside, all offence is a waste of time unless you can at least get the ball in the gap in the hands of a good decision-making inside player. Defensively, teams play zone to A) keep opposition off balance, B) trap in key areas of the half court, C) avoid fouls, D) protect a weak defensive player (liability), E) show a different (confusing) look to opposition as they may not see many zone defences and therefore not do much work on zone offence, F) take advantage of a weaker second line of offensive players (while main players are off the floor). Carleton deploys the same strategy whether being trapped full court or in the half court – have a system. By design, the same guy flashes to the middle, the same guy gets to the rim, guards space appropriately. Need to be disciplined and patient, and look to pass out of trouble. If able to pass out of a trap situation, Carleton’s rule is that they better exploit and get the ball to 8 feet. After being trapped, players need to make sure they are catching the ball in a position where they can be effective (no different than after a post feed or a penetrating dribble). In the first week, Carleton focuses on pressure drills (not on offence). They play tough in practice, trap the first pass, look to create chaos, want five seconds of very uncomfortable unwanted pressure for the players that have the ball (force the play and decisions). In part, predicated on the FIBA 24 second clock, must play quick and get North-South in a hurry. With FIBA game, if you force a team to make 5-6 passes that are East-West then they will quickly run out of clock, be forced to play at an uncomfortable pace, and likely settle for less than first choice shot. 24 second clock takes away time available to run a motion offence - against a zone, offences need to find an early match-up and exploit it quickly. When it comes to offence, do it the easiest way possible. Be careful not to play right into a defence’s desired match-up. If defence is playing a triangle-and-2 formation, then DON’T have your guard that is being pressured by one of the two “man” defenders be the one to bring up the ball (just makes sense to avoid the match-up). A triangle-and-2 matchup usually looks to take the ball out of the hands of a best player(s). Triangle-and-2 creates confusion and is employed in order to get a turnover or clock violation. To counter-attack offensively, more importance needs to be placed on exploiting the post inside (dive in, lock defender with a good seal, then look for a strong two-foot power move). Whether triangle-and-2 or box-and-1, objective is to use the same concept of making defenders decide who they’ll guard (which places importance on offence getting to good spaces despite being covered by the 1 or 2 man defenders in the combination defence). Combination zone defences allow the offence to use screens more effectively to get people open, and then read and play with good offensive decisions (based upon defensive reactions). Contrary to what many believe, most of his coaching experience has been at the club and high school level (4000 games) as opposed to university (300 games or so). For fun, and to be around good kids that want to learn, he coaches at the Grade 7 & 8 level in summer. 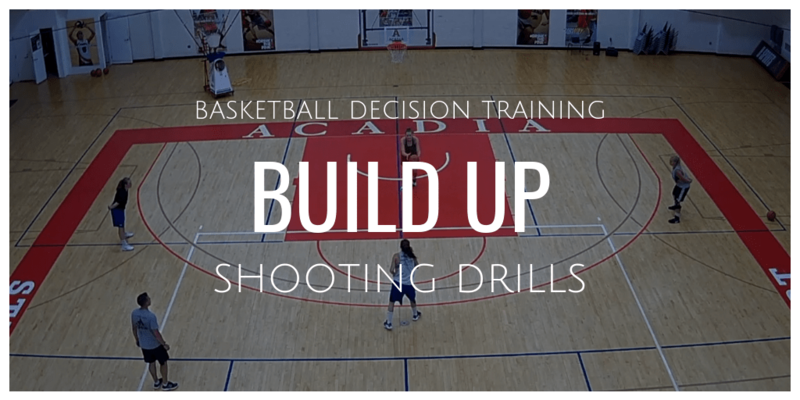 Very important for coaches to decide (and communicate the decision) when they are running DEVELOPMENT drills and when running COMPETITIVE drills. Need to strike a balance, define what you do and to what percentage you emphasize two sides. Ideally, teach the finer points (development) but still foster a “get it done” attitude (which requires proper explanations as well as providing opportunities for competitive application and scoring). DON’T keep score (be competitive) in development drills, very unfair and confusing to young players. Keep score in the games, drills, and situations where. you want players to show coaches an application of knowledge and a willingness to fight to the finish. Be mindful to NOT develop great “drill” players that perform well in practice and then poorly in games (which is what DETAIL coaches tend to produce from their programs). COMPETITIVE coaches throw the ball out and say to players “just get it done” and “find a way to succeed”, however the problem is that they don’t perform well against the teams that are well-coached in a technical sense AND are also fierce competitors (they’ll be smashed by that team). Carleton wants COMPETITORS, not simply competitive players (there is a big difference) – they want players that will find every possible way (even so far as to cheat) to win in a competitive drill. They promote creativity, want players to find the “good” ways to cheat to win a drill, have them be mentally awake and looking/thinking for loopholes. Great source of controlling in order to get what a coach wants, as you can leave loopholes in rules in order to see if players push and discover them (make them be creative, resourceful). Keep control and make rules that take away the “bad” or lazy ways that players are cheating – there is a big difference between creatively looking to gain an advantage and lazily looking for a shortcut. Coaches need to ask themselves HOW they officiate a drill and WHY they do it a certain way. If working smart, they will officiate to get out of it what they want, such as A) represent the way they expect a particular upcoming game will be played, B) to develop the manner in which they want their team to play in games, C) emphasize points that they want to teach, D) create anxiety for the team overall, or get certain players to play through frustration and adversity (make them tougher). As a coach, in order to get desired results, you basically have to cheat when you ref your drills. End game is to have COMPETITORS that will find a way for their team to win (how tough are they?). Coaches need to prepare their team to face the toughest possible challenges and situations (if a team’s own coach does not provide it’s biggest challenge, then an opposing coach and team will do it). Need to coach any team based on it’s best players (pull others up to that highest level). If a team loses its last game then it did NOT do its best (room for improvement). If you expect wars in games (especially as the season draws to a championship) then there need to be wars in regular practices, therefore encourage lots of contact and incite a war. At Carleton, practices are three times harder than their toughest game with an opponent (there is high competition between players on their own team). Concept is to be toughest on your toughest player, you want your best player NOT to foul out in a game so therefore you need to be hard on them in practices to learn that lesson. Coaches want their worst player to play “tough” and not shy away against the good players on opposition (in practice, call fouls very quickly and with very little leeway on good players, let lots go for the weak players – make all players, good and bad, make good decisions while on the floor). Force good players to rise above adversity by allowing them to be attacked by the bad players (and NOT get called for it – places the importance of “reffing to get a desired result” in practices). As with reffing, the same concept applies to point scoring systems in practice – award points for performance in order to attain a desired result from a drill (get focussed results by rewarding points of emphasis and punishing areas of weakness, should elevate overall performance of the team). Keep score in EVERY drill (competitive ones) as coach should want players to compete hard all of the time (they will “turn off” mentally if score is not kept in a drill – need to keep them sharp). Coach Smart prefers to get running done in drills as opposed to conditioning from dryland training. When running drills, the coach controls the variables in order to achieve a desired outcome – coach makes the rules, picks the players on the drill teams, picks the teams that will face each other, refs in a certain manner, etc. Need to make sure that, as a coach, you don’t care who wins a drill – just want an environment where you can bring out your leaders and have them lead, provide opportunities for competitors to make those around them better (position them to prove and improve leadership). Coaches need to make rules to suit the outcome, test their players, promote the development of a certain culture (which does NOT always mean that it will be FAIR). IDEA – put the worse conditioned player on the same drill team as his/her best friend – forces better player to find a way to motivate their friend and get them in better shape and playing at higher level (also another opportunity to pull leadership out of somebody, make them find a shortcut). Challenge players to make their team-mates better (need to help with preset situations). Individuals make decisions all day every day, “life” affects players daily before they show up to the gym, need to strengthen mentally to strip away the emotions of moments and minimize distractions. As a team, they seek mental toughness, want players to make their team-mates better (pull them up). Competing hard right from the first day of workouts will set the tone for how a coach expects the team to play all season (the players WON’T accept a lesser effort from each other, after all, they will get what they accept FROM EACH OTHER). September is the time to develop the “team’s culture” (which will be based on how leaders step up). Determine the culture of the team very early (need to create it), and then set upon reinforcing it. With most drills at Carleton, they split entire group into 3 teams so that two are playing while one is off (shooting free throws, etc.). In practices, as a team, they focus on their weaknesses in drills – for example, if a team in a drill is able to do something to it’s strength (i.e. able to go right when being forced left) then they are punished. Example of drill punishment is to stop the drill, have the punished group run two full court down and backs in under 19 seconds, then put them right back in the drill with no break (others were resting). Losing in a drill means running 3 suicides under 88 seconds while winners are off shooting. Having a system of payments creates toughness in many ways – after having some success, Carleton had a crisis of not playing well mentally and physically so they turned up the toughness on the guys – the result was that they went from “soft” to not losing for the rest of the season. High level of toughness comes with a risk – guys will be extremely tough mentally but risk fatigue and being physically banged up. Coaches often ask “how do certain players play well in big situations?” but Coach Smart believes that they don’t play “well” – in fact, they play a “normal” game (because of their training) while others around them are choking and NOT playing well – this concept needs to be taught to players. Need to train players NOT to think about what they need to do or how important a certain game is, instead encourage them to play how they are used to playing – in practices, coaches need to make their “normal” situation as tough as possible (then there will be no surprises in important competitions). If players are used to crisis and chaos then they’ll play with a sense of calm and patience in games. NEVER underestimate what younger (club, school) players are capable of doing – test them. Younger players have fewer bad habits to be broken, are more open to learning, and are easier to teach. They also have short attention spans so they need to be quickly transitioning in shorter drills. They are willing to learn, want to get better, and don’t feel that they already know EVERYTHING. There are more development opportunities with younger players, but they also like to play. In workouts, structure the development in the first portion, making it clear from the beginning that competitive games and drills will follow if good work is done earlier (you’ll have their attention). Again, importance is on making messages CLEAR – the kids need to know when you are teaching in a development mode versus having them compete in a score-keeping situation. With respect to competition, if it is not introduced by Grade 9 then Coach Smart feels it is too late (has to be brought in early enough in a player’s life so that it can be developed properly). Example of competitive vs. competitor – in CIS, Carleton’s players are in the gym for 6 hours each day during the summer and are being COMPETITIVE. Great insights into the mind of one of the best basketball coaches in Canada. Thanks for summarizing, Coach. Coach Smart (and Coach Oliver): Thank you for sharing this veritable wealth of information and insights. This should be given it’s proper presentation in a book!